To reach the cemetery from Florence, Alabama, travel Alabama Highway 20 west for 14.6 miles. Turn right onto County Road 5 and go about 4 miles to the cemetery on the right side of the road. The Austin Cemetery originally was in another location on land that the Indians cleared. Due to it being in a low wet area, it was moved to its present location. There are several markers in this cemetery that are very difficult to read. A few were impossible to read due to deterioration of the surface. The cemetery appears to have been targeted by vandals in the past, as many stones are broken or missing. The cemetery is maintained well otherwise. The Liberty Baptist Church, which sits about 2 miles south, started the cemetery, but as time passed, deceased members were buried in other cemeteries. Mr. Robert Austin, who is buried here, gave the land for the cemetery. A large amount of land along the Natchez Trace Parkway & Big Cypress Creek is still owned by members of the Austin family. 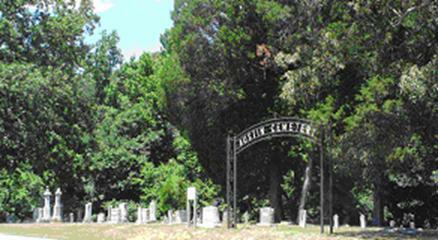 The Austin Cemetery is located in west Lauderdale County, Alabama near the Threets Crossroads community. This cemetery has approximately twenty-five graves marked only with stones. It is said that there are more that are not identifiable at all, even by way of depressions in the ground. Adams, Annie Genevia, b. 14 Jul 1899, d. 11 Jun 1900, infant daughter of W.T. & C.S. Adams, Mary Inez, b. 27 Apr 1898, d. 19 Aug 1900, infant daughter of W.T. & C.S. Austin, Frank, b. 13 Apr 1909, d. 28 May 1926, son of E.B. & M.L. Austin, Fred W., b. 24 Dec 1922, d. 03 Sep 1955, son of Roy B.
Austin, Harriet, b. 11 Jun 1824, d. 20 May 1908, wife of Jesse Y.
Austin, Hazel (Moore), b. 12 Oct 1927, d. 02 May 1993, 1st wife of Joseph R. Sr.
Austin, infant, b. 21 Jun 1949, d. 21 Jun 1949, son of M. Dupree & Toye B.
Austin, infant, b. 13 May 1870, d. 13 May 1870, daughter of F.M. & S.L. Austin, John L., b. 27 Nov 1849, d. 11 Jun 1911, father of Edward B.
Austin, M. Dupree, b. 29 Mar 1908, d. 29 Jun 1993, husband of Toye B.
Austin, Margaret A.M., b. 10 Sep 1859, d. 16 Sep 1881, wife of C.P. Austin, Mary Louisa, b. 13 Nov 1873, d. 13 Apr 1953, wife of Edward B.
Austin, Roy B., b. 23 Jul 1897, d. 25 May 1975, son of Edward B.
Belew, George P., dates not legible, son of D.L. & A.M.
Bevis, Mary Elizabeth, b. 05 Mar 1887, d. 14 Jun 1904, wife of James A.
Bevis, Paul, b. 12 Sep 1909, d. 08 Oct 1909, son of J.R. & M.C. Darby, A.J., b. 01 Dec 1872, d. 01 Jan 1873, son of D.J. & N.P. Darby, Belvah, b. 21 Nov 1889, d. 28 Mar 1913, daughter of B.L. & E.L.
Darby, J.D., b. 18 Jun 1815, d. 12 Jul 1903, husband of Lucinda L.
Darby, James, b. 11 Jan 1874, d. 08 Sep 1881, son of D.J. & N.P. Darby, Levarah, b. 06 Jan 1918, d. 10 Mar 1918, infant daughter of W. Hubert & Lida B.
Darby, Lucinda I., b. 03 Jun 1839, d. 04 Apr 1894, wife of J.D. Darby, M.B., b. 26 ??? 1883, d. 26 May 1899, son of D.J. & N.P. Darby, Martha E., b. 05 Oct 1859, d. 01 Dec 1862, daughter of J.D. & S.T. Darby, Mary J., b. 06 Mar 1846, d. 02 Apr 1863, daughter of J.D. & S.T. Darby, Myrtle Dean; b. 29 May 1931, d. 16 Jun 2012, wife of Hubert Jr.
Darby, Nancy S., b. 22 Oct 1854, d. 04 Apr 1864, daughter of J.D. & S.T. Darby, Rebecca V., b. 01 Sep 1844, d. 02 Oct 1845, daughter of J.D. & S.T. Darby, W. Hubert Sr., b. 23 Jun 1895, d. 25 Apr 1983, husband of Lida B.
Davis, Robert L., b. 19 Mar 1880, d. 17 Apr 1940, husband of Sarah E.
Dowdy, George W., b. 18 Feb 1856, d. 09 Jan 1894, husband of Mary J.
Dowdy, Jno T., b. 20 July 1831, d. 04 Feb 1902, husband of Sarah J.
Dowdy, Louisa, b. 19 Nov 1822, d. 10 Jun 1888, wife of J.B.
Dowdy, Sarah J., b. 14 Oct 1834, d. 11 Apr 1896, wife of J.T. Gambol, Lizzie C., b. 29 Mar 1880, d. 22 May 1904, wife of J.W. Huckaba, Bessie Maynard, b. 08 Apr 1903, d. 06 Nov 1905, daughter of O.F. & F.E. Lawson, Annie, b. 30 May 1907, d. 28 Oct 1914, daughter of A.M. & M.L. Lawson, Flora A., b. 24 Aug 1855, d. 15 Jan 1946, wife of J.B.
Lawson, J.B., b. 18 Nov 1853, d. 21 Oct 1928, husband of Flora A.
Lawson, Rachel, b. 20 Oct 1831, d. 14 Feb 1914, wife of T.J.
Lowe, infant, b. 18 Aug 1954, d. 18 Aug 1954, daughter of Mr. & Mrs. John W.
O’Kelley, Clarence E., b. 26 Aug 1914, d. 25 Feb 1925, son of J.M. & M.C. Paulk, Frances, b. 06 Dec 1902, d. 21 May 1903, daughter of Rev. R.E. & Roxie L.
Paulk, Jonathan Ray, b. 17 Jul 1900, d. 05 Jan 1902, son of Rev. R.E. & Roxie L.
Paulk, Mary A. Parilee, b. 29 Jun 1840, d. 09 Aug 1901, wife of Dr. S.O. Perkins, Nancy, b. 1841, d. 25 Jul 1880, wife of J.M. Perkins, Oscar L., b. 24 Jan 1892, d. 25 Jul 1919, son of J. & M.L. Phillips, J.E., b. 29 Nov 1845, d. 05 Feb 1933, husband of Sarah D.
Phillips, Sarah D., b. 22 Oct 1842, d. 19 Feb 1901, wife of J.E. Pickens, infant, b. 27 May 1875, d. 27 May 1875, son of W.B. & A.J. Pickens, Johnie C., b. 11 Oct 1879, d. 14 Aug 1881, son of W.B. & A.J. Pool, Hettie L.A., b. 18 Jul 1877, d. 21 Sep 1878, daughter of J.M. & A.M.
Roach, Jannie, b. 24 Jan 1848, d. 04 Dec 1922, wife of W.G. Sego, James H., b. 27 Aug 1921, d. 30 Oct 1921, son of J.A. & Nora B.
Sego, Nora (Young), b. 11 Mar 1885, d. 18 Aug 1924, wife of J.A. Sego, Robert L.; b. 09 Mar 1884, d. 01 Jan 1886, son of E.M. & M.E. Threat, infant, b. 01 Dec 1884, daughter of J.M. & M.J.
Threet, Jane C., b. 29 Dec 1841, d. 13 Nov 1922, wife of W.F. Threet, Jane, b. 07 Jan 1867, d. 15 Feb 1909, wife of J.M. Threet, Mattie, b. 22 Jul 1858, d. 18 Nov 1882, wife of T.W. Threet, W.F., b. 05 Mar 1839, d. 11 May 1899, husband of Jane C.
Threet, William Oliver, b. 27 Jun 1909, d. 08 Aug 1911, son of J.F. & A.B. Wright, Nellie, b. 27 Feb 1886, d. 19 Jan 1956, wife of F.M. Wright, Nina (Bell), b. 18 Feb 1884, d. 29 Jan 1919, wife of F.M. Wright, William Hubert, b. 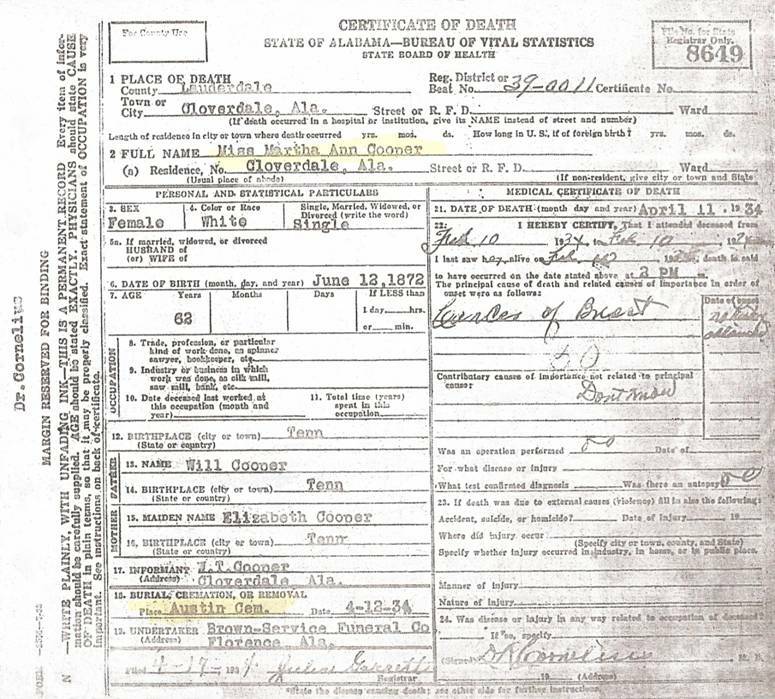 22 Sep 1908, d. 16 Nov 1992, husband of Vera S.
The death certificate copy below is of Miss Martha Ann Cooper, who is interred at Austin Cemetery. There is not a gravestone identifying her grave. The location of her burial site is not known at this time.